But in reality my home is a rather grand affair, surrounded on three sides by a forest of fir, alder and maple trees, and of late the encroaching pest of holly bushes, pretty as they may be. The ten-roomed house constructed from timber culled from the forest, the fir beams and cedar planks cut to size on a portable sawmill. The entrance with its glass-panelled red-painted double doors opens onto a mud room around which, displayed high up on the walls, are a handful of my photographs of celebrated musicians. The selection ranges from the communist folk-hero Pete Seeger on stage at a Mariposa folk festival, sometime in the sixties, his prominent Adams apple bobbing up and down; Louis Armstrong and Mahalia Jackson enthusiastically hugging each other in celebration of Satchmo’s 70th birthday at the 1970 Newport Jazz Festival; master Dadaist Marcel Duchamp playing chess with composer John Cage at a 1968 event entitled “Reunion”, where each chess move changed the sound and colour of the Ryerson Theatre; the two Steve’s – Lacy and Potts – on the back porch of Western Front both brandishing soprano saxophones and reclining about a huge sign that proclaims ART; trumpeter Don Cherry sporting a new suit with knickerbockered pants, his constant companion Edward Blackwell far away in the background, dueting at the 1986 Berlin Jazz Festival, or the cheeky one of English saxophonist Lol Coxhill. All these images epitomizing not only a visual legacy of the music, but a reminder of a past life. It’s Lol that’s the focus, the reason for this recollection, the photograph of him taken at a gig in the back room of Toronto’s Cameron House, an über-hip pub on trendy Queen Street West. A block over from Spadina Avenue. This day, October 9th, 1982, is the only time I would ever perform with Lol; two bald-headed blokes blowing curved soprano saxophones. It was a busy day, starting off in the afternoon, all jamming together in the back room of the Cameron, and that same evening out front of Buddy Selfish and His Saviours, (http://www.youtube.com/watch?v=aqJCexT8Yhg) whose musical repertoire reminisced a punkish rockabilly style – vintage rock and roll. Colin Griffiths, the guitarist from that night, visits our island once or twice a year to play some music, cook up a meal over at Tom Burrows’ studio; and I’ve bumped into the drummer Andy Graffitti down at Western Front. Me and Lol first met in London at one of Derek Bailey’s Company events, a splendid night at the Institute of Contemporary Arts (ICA) theatre, in May 1977. The program featured ten musicians from different parts of the world; Derek Bailey, Evan Parker, Lol and Steve Beresford from England, Maarten van Regteren Altena and Han Bennink from Holland, Tristan Honsinger from Canada/USA, Steve Lacy, Anthony Braxton and Leo Smith from America. All had mutually agreed to meet and create unplanned music, presenting the sound of surprise not only for the audience, but in many cases for the players themselves. Derek selecting, like a magician pulling tricks from a hat, the players names on pieces of paper, the random selections hidden from view. Out from behind the backdrop curtains came Lol, Steve, Maarten and Han. Steve took to wandering about with his collection of wind-up toys – a talent that at that time I did not appreciate – and Lol’s sliding, twisting, rhythmic melodies leading always into another dance. A young, excited Japanese spectator, seated in the front row, leapt up onto the stage in the middle of the performance, thinking he could participate, thinking anyone could join in. Part of my disguise in the eighties was wearing black police-issue work boots, hearkening back to my government housing estate heritage. The store, that specialised in worker’s attire, was further along Queen Street West, half-a-dozen blocks from the Cameron House, almost at the intersection with Bathurst Street; a district as yet not taken over by Toronto hipsters. The eighties were a fine time for improvised music, grant money allowing us to travel, even go abroad. 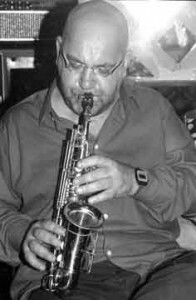 In April of 1983 my old mate, saxophonist Maury Coles, who was living in England, had, with the help of Matthew Wright, the organiser of events at the Seven Dials in Covent Garden, brought me to England under the banner Four Nights of Canadian Improvised Music. It was a wonderful opportunity to play with the cream of the British avant garde, among them trumpeter Jim Dvorak, drummer Roger Turner, bassists Ollie Blanchflower and Marcio Mattos, drummer Eddie Prevost and saxophonists Elton Dean and Harrison Smith. The gigs, apart from the Seven Dials, took place at Club Extempore, Haverstock Hill; Club Improv, Conway Street and the New Merlin’s Cave in Clerkenwell. The night that started it all off – at the Seven Dials – was with a dream band of Paul Rutherford (trombone), Paul Rogers (bass) and Nigel Morris (drums). The room was packed. From somewhere at the front of the crowd a punter sarcastically commented on my new shiny black boots, to which I responded “They’re my Lol Coxhill boots”. Out of the darkness, somewhere near the back came a familiar voice calling out, “It’s nothing to do with me”. At the conclusion of the evening a representative of the Canadian Consulate came forward and presented me with an official welcome package, her fur coat and hyphenated name causing my friend Lillie Hill, mentioned elsewhere on this website (http://rantanddawdle.ca/2012/10/05/spirits-rejoice-•-book-one/), to exclaim in her Cockney accent, “Bleedin’ ‘ell look wot just wafted in from Luton”. A saxophone sextet with Klaas Hekman – bass; Paul Termos – alto; Dies LeDuc – soprano and on tenor the Danish legend John Tchicai, one of my heroes from the sixties who had worked with and is peer to the greats in the field of “jazz” music; John Coltrane, Don Cherry, Archie Shepp, Johnny Dyani, Roswell Rudd, Albert Ayler, Dollar Brand and Cecil Taylor among his fellow travellers in the world of creative music. So there it was: four Dutchmen, a Dane and a Canadian about to develop enough interesting music to perform ten concerts in fifteen days. Jazz stories, passed down from generation to generation, made into indelible fact, are often partial truth, but as they are more interesting than the reality, they’re perpetuated. The story of how I came to be invited has been refuted by Ad Peijnenburg, but as it suits my story I shall continue to reiterate it, be forgiven as my 75th birthday is just around the corner, up the road a bit, memories imagined. As I remember, Lol had been the first choice for the Six Winds sopranino chair, participating in an earlier configuration, but realising that the repertoire of written compositions required hours of musical study, had sent a message claiming he had fallen down a flight of stairs and suffered broken bones. His recommended replacement, another sopranino specialist, being yours truly. Thanx mate for that! Is this the last time I’m together with Lol? So long ago at the 1996 Vancouver Jazz Festival – June 27th, a Thursday afternoon at Studio 16, hanging out with The Recedents, them being Lol (soprano saxophone & live electronics), Mike Cooper (Hawaiian guitar & live electronics), and another old mate – Roger Turner (drums). In the program it says that the band is named for their collectively disappearing hairlines. Half the audience at Studio 16 are loudly telling each other how hip they are, and although this may have been imagined, I do believe the Recedents responded to this situation. It’s them damn birds again, small hidden voices whirling about, the message on the answering machine advertising the lobby orchestra of Hotel Marat Sade; or Lol’s soprano sometimes seeming to be in another noisy jazz club or busking in a London tube station. A sometimes self-indulgent, although contained, system of making music, totally unfettered by acceptance. Very urban music in spite of those damn birds. Lol makes an announcement: “We probably shan’t be here for Christmas, so we’ll take this opportunity of doing our Yuletide medley”. We shall meet with this band again on the weekend. By now, after nine days of pleasure, we are seriously jazzed-out, and it’s time to relax with friends and share a pint or two of Guinness in the Unicorn Pub at the free-of-charge holiday weekend finale. No straw hats or dixieland here. We’ve managed to score a table up on the perimeter of the surrounding balcony, looking down on the stage, a perfect view of three shiny pates. Once again it’s the delightfully fertile sounds of the Recedents, always bursting forth in new shapes and colours, rummaging about a bit in the closet of things, finding something suitable for the moment, three hearts of the creature breathing at once. A whispered conversation from the stage manager, and Lol announces: “We have been ordered to stop immediately”. And so shall I. As the Matchbox Purveyors Lol and Ian Hinchliffe spent a weekend in Toronto. They performed together at the Rivoli, Friday, October 8th. Saturday the 9th was a busy day starting off in the afternoon, all jamming together in the back room of the Cameron House at John Oswald’s Pool (a regular weekly gathering that existed from 1982-1988); that evening to the Music Gallery where Lol played a brilliant solo concert, and afterwards back to the Cameron House. The following dialogue was culled from a conversation that took place on that weekend in 1982 at my house. The complete interview was originally published in Coda Magazine (Issue 189) April 1983. This is not your first venture into North America? No. About four or five years ago I decided it was about time to do a short tour of the States. Solo concerts. That was following the release of my album for Random Radar, “Digswell Duets”. So I came over to promote that. I played in a bar in New York with Tristan Honsinger. Just by chance we were on the same plane. A broadcast in Washington, and a gig there. A gig at John Hopkins University, and then after that gig I was given a lift home, but driven into a lamp post, which resulted in my going into hospital for a couple of days. I had a knock on my jaw which put it slightly out of alignment, and broke a few teeth. I managed to talk my way out of hospital, and assure them I was going to be sent immediately back to England. But I was actually going to be put on a train to New York so I could do a final gig in the Zoo Club. When I got back to England I got them to patch it up as much as they could, but it had completely changed my embouchure. Consequently after about 22 years of serious playing, I found that as far as handling the saxophone was concerned, nothing had changed, but as far as blowing it was concerned, I was virtually back to square one. Like a novice player again. To regain some kind of embouchure, and get back to whatever playing ability I had before, I spent several years playing in disco bands, and any kind of commercial thing that came up. Where I could play whatever was required of myself, without pushing myself to any extreme, and making a fool of myself. I managed to keep on working, and kept on practising, until I got back to where I was before. I did occasional solo concerts, or with other people, playing improvisations, maybe two or three times a month, but basically I was doing commercial work while I regained my strength. So that was my American tour. So coming to Canada is the first one where I have been in control of what I’m doing. I’ve liked being here very much, particularly Toronto. I love Toronto, I think it’s one of the best places I’ve ever been. I find visually just walking around, the changes from house to house in certain areas quite exciting to be in really. I’ve met musicians and people interested in the music that I’ve been happy to meet. I’m very glad I came. It’s not that well-organized a tour, we are not going to make any money, but as far as the music is concerned it’s very well worthwhile. The whole thing about London is something of a myth, because there are not that many places where we can play. Or if we do play there’s very little chance of earning any reasonable kind of money. Thinking in terms of improvising, or less commercial fields, London is not, in my mind, one of the places where I particularly prefer to play. I remember, even when I played in Soul bands, and R&B bands, I used to enjoy playing in places like the Flamingo, and some of the other places in the West End [the downtown part of London, that could be compared to Greenwich Village in New York] — but I also liked going to Redcar and right up into the North of England, where there seemed to be more interest, because a gig would be more of an event than it would be in London. This is not just my feeling, this is the feeling of a lot of people. There’s not that feeling in the audiences, that they have heard everything. I was born in Portsmouth [a town on the south coast of England], but spent most of my life in Aylesbury, about forty miles from London. I always lived close enough to be able to do gigs there whenever they came up. I first started playing in Aylesbury. I didn’t start until quite late really. I went through a period, in my teen years, of wanting to look as much like a New York jazz musician as possible. When I left school I was already collecting 78s of Bird and Gillespie, so I was desperately saving, and doing overtime at the factory so I could buy a drape suit. I grew a goatee beard, and eventually managed to get hold of a saxophone, but didn’t actually learn to play it. I just pretended that I could play it. Playing with a few friends. Mostly posing. I’m glad I did, because the photos are great. This is about 1949. I was listening to bebop music when it was actually occurring. I was going around hunting for bootleg records, and occasionally finding good things, on metal acetates, or whatever they’re called. But through all of that period I was only posing as a musician. I could not actually play anything really worthwhile. I had a good basic grasp of what was going on, like I could recognize sequences instinctively, if I had a solo. But I did not start playing properly until 1960, when I bought a decent horn and studied for a year and a half with Aubrey Frank in London. He’s quite an accomplished player in the conventional sense. I studied with him quite formally. He had a partner, Frederick Staff, who worked on band grading. We would have rehearsals with big bands made up of the students. Fairly conventional studies really. After that I just carried on working in my own way, and from that point it was a process of developing my own way of doing certain things. There were only just a few of us in Aylesbury that were interested [in jazz], and we were considered to be quite weird. People just laughed at us the whole time, because of our clothes as well. Most of the people in town would be wearing quite baggy trousers that went out wider and wider, until they got to the bottom. Mine started wide at the top, and almost went into non-existence at the bottom. So we were considered to be freaks. Not mad, but just quite strange, and not to be taken seriously. This was the time when Ronnie Scott and Johnny Dankworth, and a lot of their friends were opening little clubs, and working in the bebop area of the music. They were the first people, that I heard live, playing that kind of music. The Club Eleven was the first place in London that I went to, and there was a place in Acton [a district of west London] where I remember hearing Coleman Hawkins. Very early — I think this was about 1949. The music that the Americans and the English musicians played was not exactly the same. But I found what they were doing interesting. It obviously came out of the American music, it was strongly related to it. If I hear records that I bought then, now, in a way I can get more from them now, than I did then. I would have a record of Dankworth and another record of Bird, and obviously I would think more of the record of Parker. Now if I hear some of those old things I’ve still got, I still obviously think much more of Parker, but I hear something that I did not hear then. A very Englishness about it. It’s not just a matter of not being as good, it’s just a different kind of thing. It’s people interested in what they’re doing, coming from a different place, picking up on someone else. And that’s it. A great deal of English music was an imitation of American music. There was an occasional odd ball. In more recent years there has been all of the European development, so it’s less dependent on America now. Before the Spontaneous Music Ensemble, with John Stevens, Trevor Watts, Paul Rutherford etc. in the middle sixties, I think there were just little pockets of people trying to find things, but the SME were the real basis of the change. I know at that time, even though I was doing improvisations, they were quite close to changes and melodies, I was not playing in such an open way as them, I was just distorting things that already existed. So I would go along and hear them, and I just never had the courage to ask them if I could play with them. That was the real pocket of people that were doing it. There must have been other people in other parts of England. Derek Bailey and Evan Parker, for instance, came down to London. The early players were not all London-based players. They were doing their music somewhere else, and just moved into London. Tony Oxley is not from London. I did not play with them until a few years later. Towards the end of the sixties I was becoming aware of people other than this little pocket in England. In 1969 I went to Germany with Alexis Korner, to do the Free Music Workshops in Berlin, and got to meet people whom I assumed would not like what I was doing. But did. So that was the start of it for me. I was most definitely inspired originally, to become a performer, through listening to jazz records. I wanted to become as much like Charlie Parker as possible. Then the more I got to appreciate him, the less I wanted to be like him. I wanted to sound more like myself, regardless of the fact that I was inferior. The first instrument that I owned was a guitar, but I could not handle that, so I swapped it for a very bad alto. I got the soprano later, when I was taking things more seriously, and did not depend on my appearance. I became instantly very interested in it. I got to the point of liking it so much, that I insisted on playing it on gigs even when nobody wanted me to. At that time, in the early sixties, in conventional modern jazz groups, there were not that many people playing soprano, and so a lot of people I worked with did not actually like the sound of the soprano. They related it back to [Sidney] Bechet, and thought I should not be playing that sort of instrument in a modern jazz group. By the early sixties I realized I was really into music, as opposed to the music plus the aura created around it in my own mind. I was doing a lot of solo playing then, and working occasionally in places like Ronnie Scott’s [a famous London jazz club]. Once I started taking it seriously, it was not long before I was actually doing decent gigs. I like working with the drummer Laurie Allen. I think he’s quite special really. Sitting in with people. I occasionally played with Joe Harriott, who was a good friend of mine. He encouraged me a lot. Also I worked in soul bands, and some of the blues people as they came over from America. My first pro job was with Rufus Thomas, promoting “Walking The Dog”, on an English tour. I was not aware, at that time, that anyone else was doing this, I just got into it. I started for commercial reasons, busking in the street. When I was working with Rufus Thomas, I got so little money, that to make it possible without doing non-musical part time jobs, I had to play in the street to get my travelling expenses. So it started, just sounding as though the rest of the band had not turned up. But I became really interested in the fact that it could be done, and there would not be any place for anybody else. I was not aware of Steve Lacy, or Braxton, or anyone doing it. The only person I had ever heard doing it was Tubby Hayes, for a few bars in the middle of a gig, and that very old record of Coleman Hawkins playing “Picasso”. I really did not know about a “soprano tradition”. All of my friends that I tended to go around with, who liked Parker going into Rollins and Trane, before they heard Coltrane playing soprano, and they had not heard Steve [Lacy] either, were not aware of any kind of tradition. There was nothing to tell me that there was or was not any kind of tradition. I knew that I was supposedly playing a New Orleans-related instrument, in a non-New Orleans way. This scenario built around the idea of me playing in the streets, is the classic thing of looking for the artistic looney. What’s so special about the fact that I was busking, playing improvisations on a saxophone? So what! My reasons for doing it were perfectly logical. Later on, for about a two-year period, I did almost exclusively that because I really wanted to play solo things. I could not get gigs in clubs doing it, so the only way to do it was on the street. It’s just nonsense really — to make a big deal of it is nonsense. I don’t mean doing it is nonsense, doing it is a perfectly logical, valid thing. Journalists found it a good thing to bounce off of. Whenever a journalist said he wanted to write about me, I always would ask him to review it as though it were a gig in a club. But nobody ever would. I was always trying to get people to review the busking as a gig. I would say — if you want to do a review, I’ll be here, unless I’m moved, between certain hours. Come and do it. It’s a gig. “Murder In The Air” (can be found on Emanem 4204 – Spectral Soprano) is a play performed by Lol, in which he is all the characters. I had suggested to him, as he has performed this under many circumstances, including countries where the language is not English, that this seems to be very much in the English vaudeville tradition. I suppose you could see it in that way, but the interest for me is in the sound dynamics of it. It’s a bit like playing. I have the basis of the play itself, but it’s very different every night. In foreign language countries, it gets back to the thing of it being sound that interests me. The time, the change of volume levels, that’s what interests me anyway. I can work in that way in most countries and people find it interesting. If anything, I prefer to work in a country where they don’t know what I’m saying, because then it’s got to be the sound and dynamics. Even though it’s ridiculous — the reasons for doing it are serious. For quite a long time I have been including verbal things, doing little playlets and saying one thing and doing something else. I just got pulled into that area by people seeing me doing it. I became musical director of Welfare State for two years, just because they saw me doing a gig. Welfare State is an international touring group, who do quite large-scale events, usually in the open air. Or sometimes under canvas. Mike Westbrook wanted to stop working with them, so he suggested that they have me. They use dance and music. A lot of it is very visual. Through working with them, other people saw me, and it went from there. I don’t think though, that it’s possible, necessarily, to include more theatre outside of the normal jazz tradition. What you have in England, is somebody like George Melly, who is presenting songs in a very up front theatrical way. They will accept that from singers it seems. But in the case of people like myself, if I say or do something that can be taken as being non-serious, then that reflects upon how I appear as a musician to certain people. If I do or say something silly, and then play something which is totally serious, then quite a few people are not going to accept that as being of any great validity, because they don’t consider me to be a serious person. But almost everything that I play is very serious. I’ve been involved with lots of things outside of the jazz tradition, and this does not help me. It stands in the way. It means that people who are interested in more verbal performance hear me play the saxophone. They think — what a pity he’s playing the saxophone. I’d like to hear him talk more. If people want to hear me play saxophone, they think — oh why doesn’t he Shut Up talking. So I’m creating barriers for myself, but it’s something I can’t avoid. I’m interested in doing all these things. If I work with a pop group, for instance The Damned, a lot of people who think of me as a serious player, object to the fact that I work with them. So they don’t come to hear what I’m doing. If they did, they would find that I’m playing free improvisation within a rock environment. A lot of people who came to hear The Damned liked me. So all that’s constructive, but it seems like fooling around and not being serious. I’m not a warm up act for a rock band, I do the whole set with them, without rehearsing. I don’t learn what they are doing. I say — I will do it if I have an open hand. The only people that ask me are into that idea anyway. So I think all of that is very constructive. I’m whatever I am, with a lot of jazz references there, obviously, and I’m certainly an improvising musician, although I like playing structured things as well. I do have a lot of curiosity about the old things. Anyone interested in jazz has a lot of that as their background. A lot of contemporary players choose to disregard that. What I’m trying to say is that most of the contemporary players I know, do have a knowledge of R&B and soul music, and the whole range of jazz, but they don’t want to play anything other than free improvisations. Whereas if I’m interested in a particular music, I want to see what I can do of my own within the restrictions of that music. The last decade in North America, has produced a kind of jazz music education in universities and colleges. It seems that the idea has become like learning any other subject, so that the essence of improvisation, which is performance, has disappeared, and been replaced with an assembly line concept. How not to play Jazz. There is this system in England. There are various bands where you are taught section work, and taught to play in a particular way. You are told certain things are wrong. I’m sure in most countries there is something similar. In one way it’s good, because you are learning techniques, but in another way you are being sat upon and being told not to go beyond what already exists. There is of course more to it than that. There is the intermingling of people with a totally different approach. If you think of the sound of a Sun Ra orchestra compared to the sound of a Glenn Miller orchestra, where with Sun Ra you are aware of the sound of different people, even though they are playing well within the structure, with Miller there is the classic thing of getting a uniform sound, so you don’t recognize individuals. I’m interested in the thing of actually making up the sound of an orchestra from the people who are in it, and having some awareness of these different tones for individual instruments. But the teaching set-ups try to get you to have this uniformity, which is fine as a thing of the past perhaps, but in jazz more can be done now. In the orchestras that I had played in, actually it was very formal. It has a place where it tells you you are allowed to stand up and improvise. Then you have to sit down at the right point. The Brotherhood [Of Breath] – (http://rantanddawdle.ca/2013/01/16/wish-you-sunshine/) was much more open than that. There were written structures which you could play dead straight if you chose to, but so many different things happened on the event. If something was going strongly, then someone from another area of the band would chip in, it would go off on a tangent, and then be pulled back again. So there was always an element of surprise. Every gig there were surprises. That was what was so interesting about it. It meant that some gigs were better than others, but I think that’s fine. That element of chance is interesting for me. I can’t think of any band that had anything at all related to the Brotherhood, before the Brotherhood. The bands that I had played in before were very formal, but sometimes good. When I was asked if I wanted to be in it, I was very pleased. What the hell is Johnny Rondo? That’s been going on for five or six years now. Originally, David Holland the pianist, not the bass player, had thought of the idea. He had a group called the Johnny Rondo Combo. He thought of the name because he’d seen an old B movie, I think it was in Hawaii, a detective film, and there was a little band playing, with Hawaiian shirts on, playing in the background while all the action was going on, and written on the drums was Johnny Rondo. So he thought that he would have a Johnny Rondo Combo which would be very much a background group that played all kinds of stuff that could be ignored. But if listened to, was not quite what you thought it was in the first place. I became interested in it. I had known him [Holland] from the Welfare State days; in fact I joined the Welfare State because I wanted to work with him. When I joined, he left, so it was not until much later that we had a band together. The trio was formed with Dave on piano, me on soprano and occasional vocals, and Colin Wood on cello. We got into the area of the little restaurant bands that you sometimes see in old German movies, where you might not see the band, but for all the action going on within the film, the whole mood is created by this little band, off in the corner somewhere. We were all improvisers who wanted an alternative to being up front musicians, so we thought that would be it. The little restaurant trio. But that developed into improvisation as well. That inevitably had to come back again somewhere. Then Colin Wood left. We had a gig in Berlin at the Floz Club for ten days, so we decided to take Mike Cooper on guitar, so that’s now the New Augmented Johnny Rondo Duo. That’s the name of the band. All the photographs of Lol at the Cameron are taken by Bill Smith. 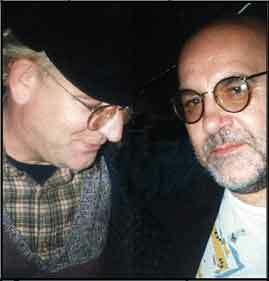 Bill & Lol in the Underground – photographer unknown. Thanx to James Bailey for providing me with CDs of all the events that took place that memorable weekend in October, 1982. 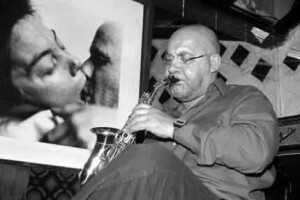 Soundtrack – Lol Coxhill (soprano & tenor saxophones, voice, electronics), Archie Leggett (bass), Robert Wyatt (drums & chicken clucks). Freely improvised duets by a couple of chatty old mates, both masters of the idiom. Lol in a variety of combinations. A book by Jeff Nuttall with accompanying cassette tape.